TUESDAY, Aug. 12, 2014 (HealthDay News) -- Approximately two out of every five Americans will develop type 2 diabetes at some point during their adult lives, according to new U.S. government estimates. The ongoing diabetes and obesity epidemics have combined with ever-increasing human lifespans to increase lifetime risk of type 2 diabetes to about 40 percent for both men and women, said lead study author Edward Gregg, chief of the epidemiology and statistics branch in the division of diabetes translation at the U.S. Centers for Disease Control and Prevention (CDC). "We weren't necessarily surprised that it increased, but we didn't expect it to increase this much," Gregg said. "Forty percent is a humbling number." The odds are even worse for certain minority groups. Half of black women and Hispanic men and women are predicted to develop type 2 diabetes during their lifetime, the researchers reported. Results of the study were published online Aug. 13 in The Lancet Diabetes & Endocrinology. Although the study didn't separate diabetes by type, the vast majority of people with diabetes have type 2 diabetes, according to the American Diabetes Association. In type 2 diabetes, the body either doesn't produce enough insulin and/or is resistant to the effects of insulin, a hormone needed to use the sugars from foods to fuel the cells in the body and brain. Obesity is a major risk factor for type 2 diabetes, but it's not the only one. Genes also appear to play a role in the development of type 2 diabetes. In the current study, researchers evaluated medical information and death certificates for about 600,000 adults between 1985 and 2011, to estimate trends in lifetime risk of diabetes as well as years of life lost to diabetes. During the quarter-century studied, lifetime risk of type 2 diabetes increased for the average 20-year-old American man, jumping from nearly 21 percent in the late 1980s to just over 40 percent in 2011. For an average 20-year-old woman, the risk increased from 27 percent in the 1980s to almost 40 percent, the investigators found. The "diabesity" epidemic is the main driver of these increased risks, said Dr. Minisha Sood, an endocrinologist at Lenox Hill Hospital in New York City. Doctors have coined the term "diabesity" to reflect the combined effects of the diabetes and obesity epidemics. "They go hand-in hand," she said. People also are living longer, which makes them more likely to develop diabetes at some point during their lives given the lack of exercise and eating habits of the average American, Gregg and Sood said. Not all the news from the study was bad -- the researchers found that people with type 2 diabetes are living longer than in the past. The CDC researchers estimated that the number of years lost to a diabetes patient diagnosed at age 40 decreased from nearly 8 years in the 1990s to about 6 years in the 2000s for men, and from almost 9 years to just under 7 years for women. 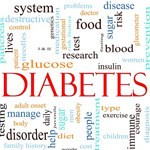 People with type 2 diabetes are living longer due to better medications and treatments for both the disease and its complications, which range from loss of vision and nerve damage to kidney failure and heart disease, Gregg said. "Even after people develop complications of diabetes that used to increase risk of death, there are so many ways to keep people alive longer these days," he said. The impact on society will be immense as more Americans end up living longer with diabetes, Sood predicts. "It's rending people incapable of enjoying a good quality of life. It's raising health care costs at an alarming rate. And frankly, there aren't enough health care professionals to deal with what's coming down the pike," Sood said. "We're looking at clogging up a health care system that's already stretched to its limits." But Gregg suggested that this gloomy picture can change with effective efforts to combat obesity and diabetes. "If prevention efforts take hold, then the equation for lifetime risk will change pretty quickly," he said. But quick-fix solutions such as weight-loss surgery won't cut it, he added. "The thing that's going to have the biggest effect is if people with multiple risk factors can make sustained changes in their lifestyles," Gregg said. "Weight-loss surgery is an option for some and it is highly effective, but that's not going to be the solution for the large number of people at risk for diabetes." Doctors, public health officials and other health care advocates need to figure out better ways to guide busy Americans to a healthier way of living, Sood said. That includes taking time to exercise nearly every day, eat right, and get good sleep.